Residents of Danbury are invited to a legislative forum to learn about the true scope of financial hardship in Connecticut and participate in an in-depth discussion on strategies to help ALICE households achieve financial security. 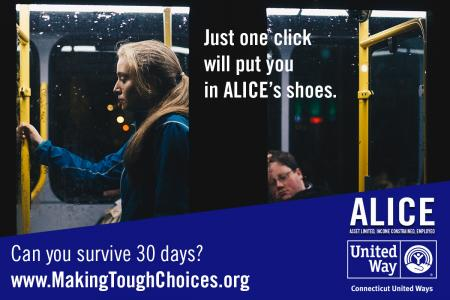 Danbury residents can learn more about ALICE by visiting United Way of Western Connecticut, or calling (203) 792-5330. According to the 2018 Connecticut United Ways ALICE Report, Connecticut's 3rd ALICE Report, 40% of CT households are unable to make ends meet. Of this, 30% (404,035 households) have earnings above the federal poverty line but below a basic cost-of-living threshold known as the Household Survival Budget. ALICE cares for our children and aging parents, fixes our cars and works in our local grocery stores, retail stores, and restaurants. ALICE is our friend, neighbor, coworker and family member. We lean on ALICE for support, yet, many ALICE households are one emergency away from a financial crisis impacting their ability to feed their family, heat their home, maintain their housing, and ensure their medical care.